A Rochester native, Pennington, 39, has a few other things going on—she’s got a day job, is helping her mom move into a condominium and has cleaning to do. But Zumba calls her name. Pennington attended a day-long training in the Twin Cities to become a Zumba instructor. Then she devised the idea to host Zumba classes on Peace Plaza. She checked with the Rochester Downtown Alliance, who gave her the go-ahead. Pennington says her goal was to bring that Zumba energy to people on Peace Plaza. She invited all of Rochester’s Zumba instructors to be a part of the fun, and a few joined her. 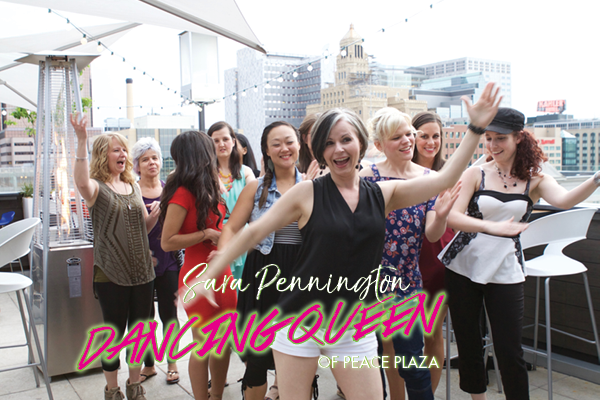 It’s hard to count heads while leading a Zumba class, but Pennington estimates as many as 130 people attend the Peace Plaza Zumba sessions. She’s also discovered that this is a gateway for people to discover Zumba. Many have never tried it before, but the allure of a free outdoor class on the plaza is too enticing to resist, so they end up dancing the night away. Take Maxine Pfeifer, who has been attending since the class launched five years ago. This summer, Pfeifer, 30, plans to bring her young daughter who also loves to dance. Beber also appreciates that while Pennington is the lead instructor, she includes various other Zumba instructors each Monday throughout the summer. They each add their own energy, flare and musical variety to the fun, says Beber. Pfeifer and Beber echo Pennington’s affirmation that Zumba is for everyone no matter their age, gender or ability. Having male instructors doesn’t hurt, Pennington says. Pennington says she never envisioned that Zumba on the Plaza would become this popular, but here it is. She’s got more than 100 people dancing outdoors to international music. EDITOR’S NOTE: In the 1990s Colombian dancer and choreographer Alberto “Beto” Perez created Zumba, a high-energy dance fitness program. The choreography incorporates hip-hop, merengue, salsa and cumbia to Latin rhythms and popular dance club songs. In preparation: Wear tennis shoes and exercise clothes and bring a sweat towel and water bottle. Water refills available as supplies last.